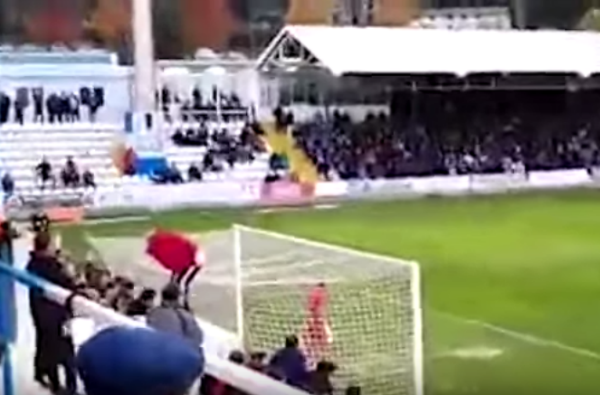 Supporter's cheeky intervention leads to skied spot kick in Valencian derby. Watch the moment a resourceful Alcoyano fan moons Hércules penalty taker Chechu Flores, distracting him and causing him to miss his spot kick. The Valencian derby in Spain’s Segunda División B saw Alcoyano run out 3-0 winners, but it could have been different without one supporter’s cheeky intervention. With the penalty about to be taken, he pulls down his trousers and turns around so that his bare bottom is facing the field of play. It’s hard to say how large a role this played in Flores subsequently skying his effort, but it certainly can’t have helped. And it doesn’t get any easier for Hércules, who now lie 22nd in their division – next up they face Barcelona in the Copa del Rey.